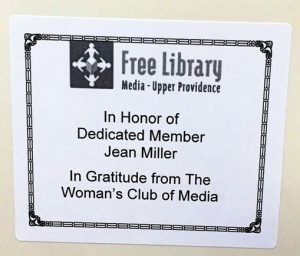 Dedicating a new book for Media-Upper Providence Free Library is a memorable way to celebrate a special occasion, holiday or family event such as a birth, graduation, birthday or anniversary. For a donation of $25 or more, you can purchase a bookplate to be placed on the front page of a new Library book in our collection. The bookplate will feature the honoree’s name and your name with a custom dedication. The new book title will be selected by a librarian based on your input. The Library will notify you and the honored individual or family with a letter describing the book dedication. Or, you can complete the form and pay by credit card, using our PayPal account, by clicking the Donate button below. For more information, call 610-566-1918 or medirector@delcolibraries.org.